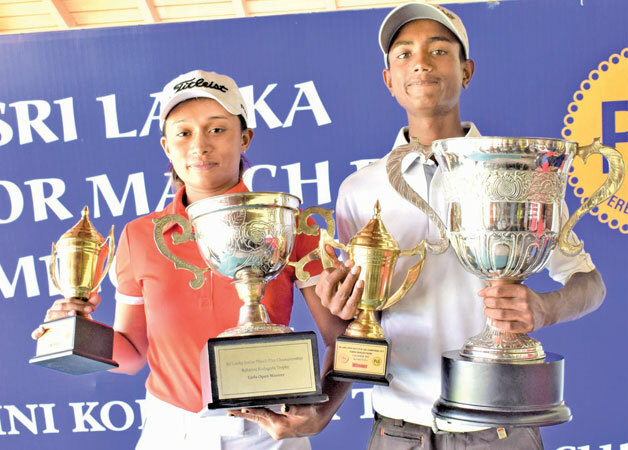 The Sri Lanka Junior Golf Match-play Championship 2019 sponsored by P & S Bakers concluded with five fantastic finals played in five different age group categories and Dhuwarshan of Nuwara-Eliya Golf Club and Taniya Minel Balasuriya of Royal Colombo Golf Club were crowned Junior Champs for Boys & Girls respectively. Dhuwarshan beat the top seed Haroon Aslam 3 & 2 to win the Gold Division age category and be crowned Boys Junior Champion 2019. In the Girls Championship, Taniya Minel Balasuriya beat her sister Sherin Mithara in the final 3 & 2, to win the Girls Championship for the second successive year. K. Danushan beat Nirekh Tejwani the top seed in the Silver Division for Boys 3 & 2 in the final to become the Silver Division champion. Reshan Algama played excellent golf to beat Kaya Daluwatte 3 & 2 in the final of the Bronze Division. Ayaan Gunasekera beat Varun Fernando in the final of the Copper Division. The Sri Lanka Junior Golf Championship 2019 sponsored by P & S Bakers for the 6th consecutive year was a great success and was played in memory of the late Rukmani Kodagoda, a former national champion in golf and tennis. President Sri Lanka Golf Rtd. Air Chief Marshall Harsha Abeywickrema, Chairperson Sri Lanka Junior Golf Niloo Jayathilaka, Captain RCGC, Shiran Fernando, Vice President SLGU and president RCGC Sanjiva Vairavanathan together with family members of P & S Bakers the match-play championship sponsors, gave away the awards.